Panama´s economy is small, very open, highly diversified, fully dollarized and highly competitive by regional standards. However, challenges remain. The political situation is generally stable, however policy effectiveness is hampered by the fact that President Varela´s centre-right Partido Panameñista (PP) lacks a majority in Congress. At the same time an official investigation has been opened into allegations of President Valera´s involvement in a bribery scandal around the Brazilian conglomerate Odebrecht. Following the Panama Papers scandal, the government is working on raising standards of financial transparency and compliance. In June 2017 the Global Forum of the OECD declared Panama 'largely compliant' on a provisional basis with international tax transparency standards. Panama´s economy is small, very open, highly diversified, fully dollarized and highly competitive by regional standards. However, the country faces challenges in terms of improving the functionality of its institutions, fighting corruption and crime as well as improving the independence of the judiciary system. In order to safeguard its position as a pivotal logistics hub and financial centre the general level of education needs to be improved. 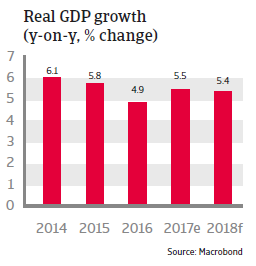 GDP grew 5.5% in 2017, and is expected to grow around 5% annually in 2018 and 2019, driven by canal expansion and public work (infrastructure) projects. Inflation is expected to remain low in 2018, reflecting the comprehensive dollarization. 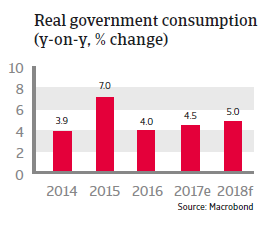 Government debt is set to stabilise at a rather moderate level (about 39% of GDP), financed at long maturities (ten years on average) and being sustainable (low debt service). However, efforts to further strengthen the fiscal framework should continue, as, despite some improvements, tax revenues remain among the lowest in the region. While the annual current account deficits remain relatively high at more than 4% of GDP, they are fully covered by foreign direct investment. External debt is sustainable, with over 50% of it accounted for by the banking system. A sovereign wealth fund and the external assets of banks mitigate liquidity risks. 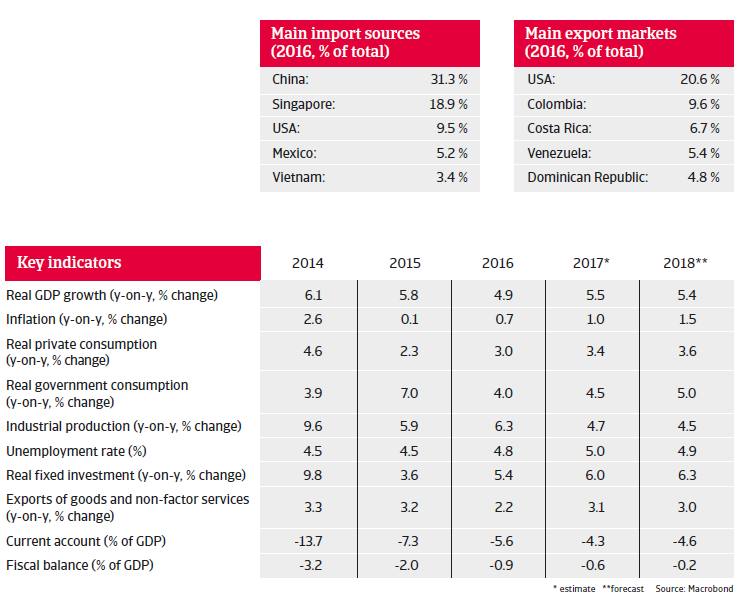 Panama´s financial sector is stable with a relatively high and rising capitalization (capital adequacy ratio above 15%) and a low level of non-performing loans. However, the IMF has advised to strengthen supervision and crisis management frameworks and to build a systemic liquidity facility for banks, as a lender of last resort is absent due to the complete dollarization of the economy. The construction segment benefits from major infrastructure projects and provides opportunities for international builders, especially after the market withdrawal of Odebrecht. 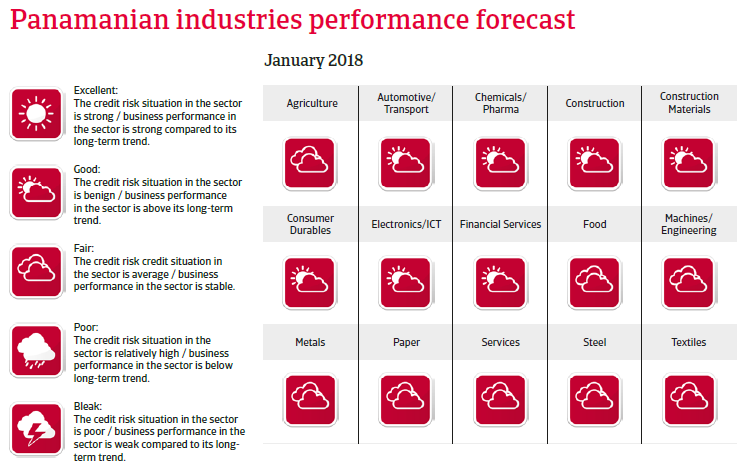 In the transport segment the short- and medium-term growth outlook is benign, as the freight subsector (road, rail, air, and sea) is expected to record robust expansion in the coming years on the back of further economic growth and infrastructure investment. Tourism is also providing the potential to further boost economic activity. Despite a rather small population, Panama will continue to provide business opportunities for foreign pharmaceutical companies due to sustained economic growth, rising demand for chronic disease treatment, the expansion of the healthcare infrastructure and limited local pharmaceuticals manufacturing capacity. That said, the market share of generic drugs will remain high, despite growing per capita spending for healthcare.